The Oxford English Dictionary defines geometry as "the branch of mathematics concerned with the properties and relations of points, lines, surfaces, and solids." Here are some examples of common shapes. 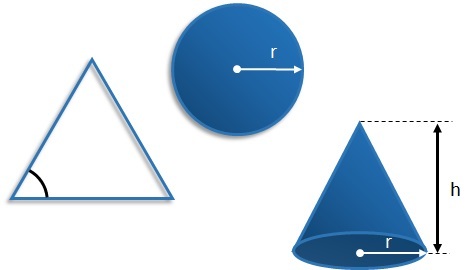 We might be interested in finding the angle in a triangle, the area of a circle or the volume of a cone. Geometry allows us to do this. Where Does the Word Geometry Come From? Geometry comes from combining the Greek words 'ge' ("earth") and 'metria' ("measurement"). Geometry means measuring the earth or land. This is because initially geometry would have been used practically to measure areas of fields and the lengths of roads. 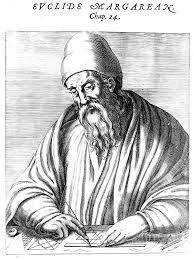 Euclid was an ancient Greek mathematician, famous for his work in geometry. His book of geometry, Elements, is one of the most widely read books of all time and has earned Euclid the nickname the Father of Geometry. Euclid has had many great fans. "You never can make a lawyer if you do not understand what demonstrate means; and I left my situation in Springfield, went home to my father's house and stayed there till I could give any proposition in the six books of Euclid at sight". Albert Einstein received a copy when he was a boy and claimed it had a great influence on him. He called Elements the "holy little geometry book". 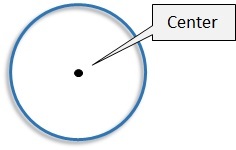 A circle is a shape containing a set of points that are all the same distance from a given point, its center. An ellipse is a shape containing a set of points whose distance from a two fixed points, the foci, add up to a constant. 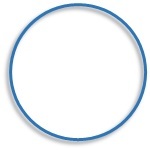 An ellipse looks like a flattened circle. 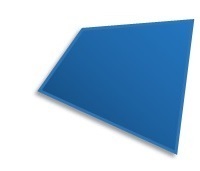 A parallelogram is a four sided shape with opposite sides parallel. A rectangle is a four sided shape with four right angles. 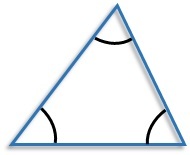 A triangle is a shape with three sides and three angles. An angle is created by two rays that have a common end point, called the vertex. The angle is also a measure of the rotation between the two rays. Angles can be measured in degrees (°) or in radians. 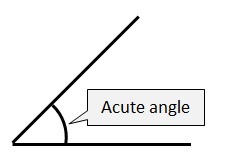 An acute angle is an angle of less than 90°. 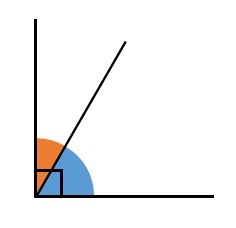 An obtuse angle is an angle greater than 90° and less than 180°. 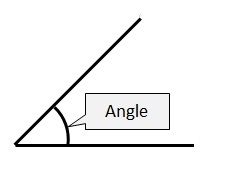 A straight angle is an angle of 180°. 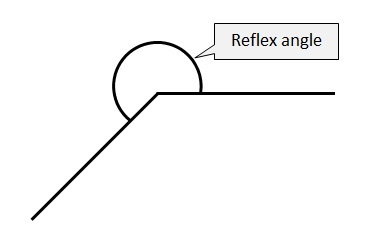 A reflex angle is an angle greater then 180° and less than 360°. 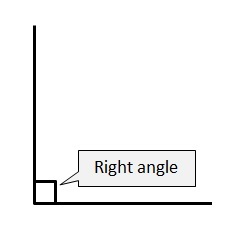 A full angle is an angle of 360°. Two angles can be classified as complementary, supplementary or explementary depending on whether they add to 90°, 180° or 360°. Complementary angles are two angles which add up to 90°. Supplementary angles are two angles which add up to 180°. Explementary angles are two angles which add up to 360°. Area is the space contained within a 2-dimensional shape. Volume is the space contained within a 3-dimensional shape. 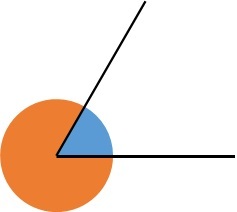 The center is the point the same distance from the points on the circle. 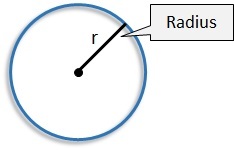 The radius is the line segment from the center of the circle to any point on the circle. 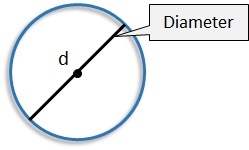 The diameter is the line segment that contains the centre of the circle and has its endpoints on the circle. 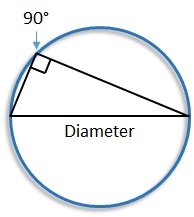 The radius can be found in terms of the diameter, circumference and area. 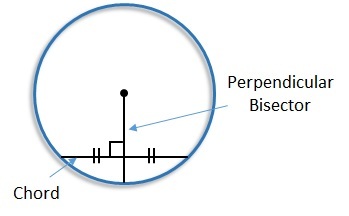 The diameter can be found in terms of the diameter, circumference and area. 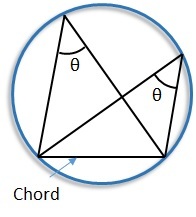 A chord is a line whose endpoints lie on the circle. 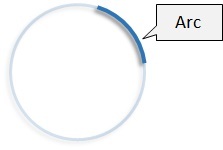 The circumference is the distance around the circle. 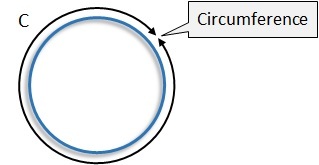 An arc is a portion of the circumference. A sector is a region bounded by two radii and the arc lying between the radii. 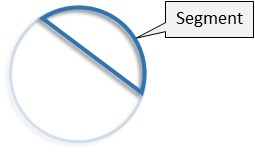 A segment is a region, not containing the center, bounded by a chord and an arc lying between the chord's endpoints. 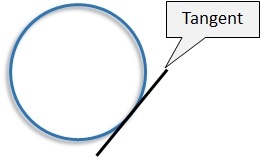 A tangent is a line that touches the circle at one point. 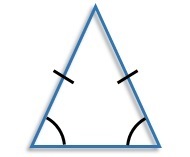 There are different types of triangles. 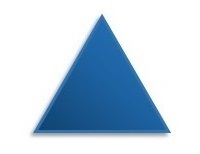 Equilateral triangles have 3 equal side lengths and angles. Isosceles triangles have 2 equal side lengths and angles. Scalene triangles have 0 equal side lengths and angles. 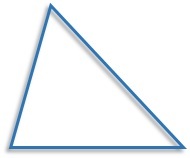 Acute triangles have all acute angles (less than 90°). 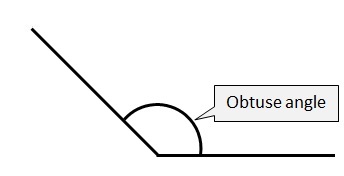 Obtuse triangles have one angle that is obtuse (more than 90°, less than 180°). 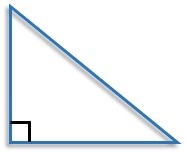 Right triangles have one right angle (90°). 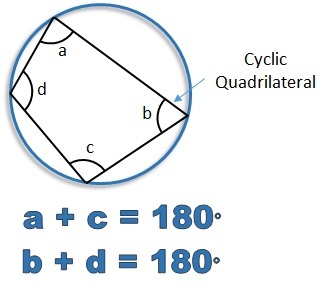 The interior angles of a triangle add up to 180°. This means a missing angle can be found if two are known. A polygon is a 2-dimensional shape with straight sides. A 3 sided polygon is a triangle. A 4 sided polygon is a quadrilateral. 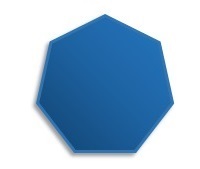 A 5 sided polygon is a pentagon. 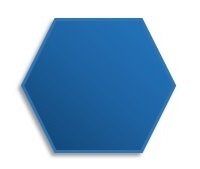 A 6 sided polygon is a hexagon. 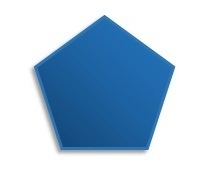 A 7 sided polygon is a hexagon. 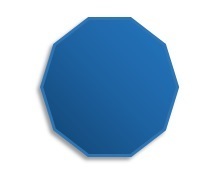 An 8 sided polygon is an octagon. 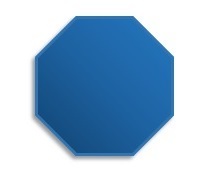 A 9 sided polygon is a nonagon. 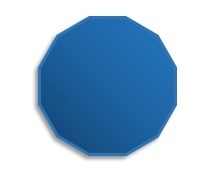 A 10 sided polygon is a decagon. A 12 sided polygon is a dodecagon. An interior and exterior angle of a polygon will add to 180°. There are many circle theorems which relate to lines and angles in a circle. 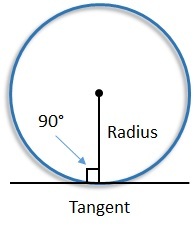 The tangent makes 90� with the radius which it meets at the point at which it touches. 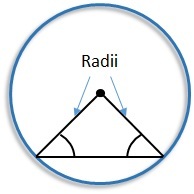 Two radii form the two equal sides of an isosceles triangle. 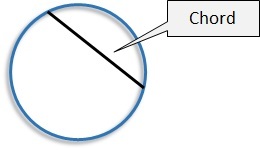 If a line cuts through a chord of the circle, such that it crosses it at 90° and cuts it in half, that line passes through the centre of the circle. The angle subtended by an arc at the center of a circle is twice the angle subtended by the same arc at the circumference. 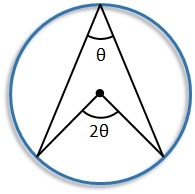 A triangle drawn from two ends of a diameter makes 90° at the circumference. 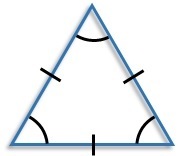 All triangles drawn from a chord make the same angle at the circumference. A cyclic quadrilateral is a 4 sided shape where each corner touches the circle. Both pairs of opposite angles add up to 180°. Two tangents drawn from the same point outside of the circle are the same length and form two congruent right triangles. 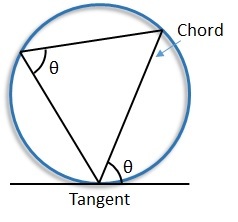 The angle between a tangent and a chord at the point of contact is equal to the angle in the alternate segment. Here is a handy list of our geometry lessons. The lessons and tests on these pages are designed to take a beginner through the basics of geometry.